"Little Rock" redirects here. For other uses, see Little Rock (disambiguation). Little Rock is the capital and most populous city of the U.S. state of Arkansas. It is also the county seat of Pulaski County. It was incorporated on November 7, 1831, on the south bank of the Arkansas River close to the state's geographic center. The city derives its name from a rock formation along the river, named the "Little Rock" (French: La Petite Roche) by the French explorer Jean-Baptiste Bénard de la Harpe in the 1720s. 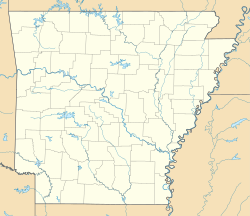 The capital of the Arkansas Territory was moved to Little Rock from Arkansas Post in 1821. The city's population was 198,541 in 2016 according to the United States Census Bureau. The six-county Little Rock-North Little Rock-Conway, AR Metropolitan Statistical Area (MSA) is ranked 78th in terms of population in the United States with 738,344 residents according to the 2017 estimate by the United States Census Bureau. Little Rock is a cultural, economic, government, and transportation center within Arkansas and the South. Several cultural institutions are in Little Rock, such as the Arkansas Arts Center, the Arkansas Repertory Theatre, and the Arkansas Symphony Orchestra, in addition to hiking, boating, and other outdoor recreational opportunities. Little Rock's history is available through history museums, historic districts or neighborhoods like the Quapaw Quarter, and historic sites such as Little Rock Central High School. The city is the headquarters of Dillard's, Windstream Communications, Acxiom, Stephens Inc., University of Arkansas for Medical Sciences, Heifer International, the Clinton Foundation, the Rose Law Firm, and Arkansas Blue Cross and Blue Shield. Other corporations, such as Dassault Falcon Jet, LM Wind Power, Simmons Bank, Euronet Worldwide, AT&T, and Entergy have large operations in the city. State government is a large employer, with many offices downtown. Two major Interstate highways, Interstate 30 and Interstate 40, meet in Little Rock, with the Port of Little Rock serving as a shipping hub. Little Rock derives its name from a small rock formation on the south bank of the Arkansas River called the "Little Rock" (French: La Petite Roche). The Little Rock was used by early river traffic as a landmark and became a well-known river crossing. The Little Rock is across the river from The Big Rock, a large bluff at the edge of the river, which was once used as a rock quarry. Archeological artifacts provide evidence of Native Americans inhabiting Central Arkansas for thousands of years before Europeans arrived. The early inhabitants may have been the Folsom people, Bluff Dwellers, and Mississippian culture peoples who built earthwork mounds recorded in 1541 by Spanish explorer Hernando de Soto. Historical tribes of the area were the Caddo, Quapaw, Osage, Choctaw, and Cherokee. Little Rock was named for a stone outcropping on the bank of the Arkansas River used by early travelers as a landmark. It was named in 1722 by French explorer and trader Jean-Baptiste Bénard de la Harpe, marked the transition from the flat Mississippi Delta region to the Ouachita Mountain foothills. Travelers referred to the area as the "Little Rock." Though there was an effort to officially name the city "Arkopolis" upon its founding in the 1820s, and that name did appear on a few maps made by the US Geological Survey, the name Little Rock is eventually what stuck. 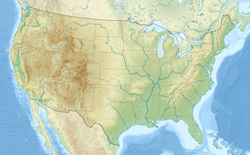 According to the United States Census Bureau, the city has a total area of 116.8 square miles (303 km2), of which 116.2 square miles (301 km2) is land and 0.6 square miles (1.6 km2) (0.52%) is water. Little Rock is located on the south bank of the Arkansas River in Central Arkansas. Fourche Creek and Rock Creek run through the city, and flow into the river. 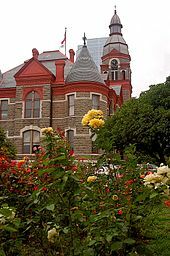 The western part of the city is located in the foothills of the Ouachita Mountains. Northwest of the city limits are Pinnacle Mountain and Lake Maumelle, which provides Little Rock's drinking water. Hillary Rodham and Bill Clinton lived in this 980 square foot (91 m2) house in the Hillcrest neighborhood of Little Rock from 1977 to 1979 while he was Arkansas Attorney General. The 2017 U.S. Census population estimate for the Little Rock-North Little Rock-Conway, AR Metropolitan Statistical Area was 738,344. 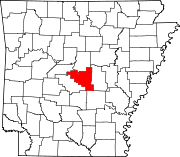 The MSA covers the following counties: Pulaski, Faulkner, Grant, Lonoke, Perry, and Saline. The largest cities are Little Rock, North Little Rock, Conway, Jacksonville, Benton, Sherwood, Cabot, Maumelle, and Bryant. Little Rock lies in the humid subtropical climate zone, with hot, humid summers and cool winters, with usually little snow. It has experienced temperatures as low as −12 °F (−24 °C), which was recorded on February 12, 1899, and as high as 114 °F (46 °C), which was recorded on August 3, 2011. As of the 2005–2007 American Community Survey conducted by the U.S. Census Bureau, White Americans made up 52.7% of Little Rock's population; of which 49.4% were non-Hispanic whites, down from 74.1% in 1970. Blacks or African Americans made up 42.1% of Little Rock's population, with 42.0% being non-Hispanic blacks. American Indians made up 0.4% of Little Rock's population while Asian Americans made up 2.1% of the city's population. Pacific Islander Americans made up less than 0.1% of the city's population. Individuals from some other race made up 1.2% of the city's population; of which 0.2% were non-Hispanic. Individuals from two or more races made up 1.4% of the city's population; of which 1.1% were non-Hispanic. In addition, Hispanics and Latinos made up 4.7% of Little Rock's population. As of the 2010 census, there were 193,524 people, 82,018 households, and 47,799 families residing in the city. The population density was 1,576.0 people per square mile (608.5/km²). There were 91,288 housing units at an average density of 769.1 per square mile (296.95/km²). The racial makeup of the city was 48.9% White, 42.3% Black, 0.4% Native American, 2.7% Asian, 0.08% Pacific Islander, 3.9% from other races, and 1.7% from two or more races. 6.8% of the population is Hispanic or Latino. There were 82,018 households, out of which 30.5% had children under the age of 18 living with them, 36.6% were married couples living together, 17.5% had a female householder with no husband present, and 41.7% were non-families. 34.8% of all households were made up of individuals and 8.8% had someone living alone who was 65 years of age or older. The average household size was 2.30 and the average family size was 3.00. In the city, the population was spread out with 24.7% under the age of 18, 10.0% from 18 to 24, 31.7% from 25 to 44, 22.0% from 45 to 64, and 11.6% who were 65 years of age or older. The median age was 34 years. For every 100 females, there were 89.2 males. For every 100 females age 18 and over, there were 85 males. In the late 1980s, Little Rock experienced a 51% increase in murder arrests of children under 17, and a 40% increase in among 18- to 24-year-olds. From 1988 to 1992, murder arrests of youths under 18 increased by 256%. By the end of 1992, Little Rock reached a record of 61 homicides, but in 1993 surpassed it with 76. It was one of the highest per-capita homicide rates in the country, placing Little Rock fifth in Money Magazine's 1994 list of most dangerous cities. In July 2017, a shootout occurred at the Power Ultra Lounge nightclub in downtown Little Rock. Although there were no deaths, twenty-eight people were injured and one hospitalized. Dillard's Department Stores, Windstream Communications and Acxiom, Simmons Bank, Bank of the Ozarks, Rose Law Firm, Central Flying Service and large brokerage Stephens Inc. are headquartered in Little Rock. Large companies headquartered in other cities but with a large presence in Little Rock are Dassault Falcon Jet near Little Rock National Airport in the eastern part of the city, Fidelity National Information Services in northwestern Little Rock, and Welspun Corp in Southeast Little Rock. Little Rock and its surroundings are the headquarters for some of the largest non-profit organizations in the world, such as Winrock International, Heifer International, the Association of Community Organizations for Reform Now, Clinton Foundation, Lions World Services for the Blind, Clinton Presidential Center, Winthrop Rockefeller Foundation, FamilyLife, Audubon Arkansas, and The Nature Conservancy. Associations, such as the American Taekwondo Association, Arkansas Hospital Association, and the Quapaw Quarter Association. Arkansas Blue Cross and Blue Shield, Baptist Health Medical Center, Entergy, Dassault Falcon Jet, Siemens, AT&T Mobility, Kroger, Euronet Worldwide, L'Oréal Paris, Timex, and UAMS are employers throughout Little Rock. One of the largest public employers in the state with over 10,552 employees, the University of Arkansas for Medical Sciences (UAMS) and its healthcare partners—Arkansas Children's Hospital and the Central Arkansas Veterans Healthcare System—have a total economic impact in Arkansas of about $5 billion per year. UAMS receives less than 11% of its funding from the state. Its operation is funded by payments for clinical services (64%), grants and contracts (18%), philanthropy and other (5%), and tuition and fees (2%). The Little Rock port is an intermodal river port with a large industrial business complex. It is designated as Foreign Trade Zone 14. International corporations such as Danish manufacturer LM Glasfiber have established new facilities adjacent to the port. Along with Louisville and Memphis, Little Rock has a branch of the Federal Reserve Bank of St. Louis. Arkansas Arboretum – at Pinnacle Mountain, it has a trail with flora and tree plantings. Arkansas Arts Center – The state's largest art museum, containing drawings, collections, children's theater productions, works by Van Gogh, Rembrandt, and others in eight art galleries, a museum school, gift shop and restaurant. Community Theatre of Little Rock – Founded in 1956, it is the area's oldest performance art company. Arkansas Repertory Theatre – The state's largest professional, not-for-profit theatre company, in its 34th season. "The Rep" produces works such as contemporary comedies, dramas, world premiers, and dramatic literature. Arkansas Symphony Orchestra – In its 41st season, the orchestra performs over 30 concerts a year and many events. Quapaw Quarter – Start of the 20th century Little Rock consists of three National Register historic districts with at least a hundred buildings on the National Register of Historic Places. Robinson Center Music Hall – The main performance center of the Arkansas Symphony Orchestra. Villa Marre – Built in 1881, it comprises Italianate and Second Empire styles refurbished in the 1960s and shown in the opening scenes of the television show "Designing Women." Wildwood Park for the Arts – The largest park dedicated to the performing arts in the South. It features seasonal festivals and cultural events. The Arkansas Arts Center, the state's largest cultural institution, is a museum of art and an active center for the visual and performing arts. The Museum of Discovery features hands-on exhibits in the fields of science, history and technology. 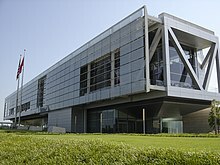 The William J. Clinton Presidential Center includes the Clinton presidential library and the offices of the Clinton Foundation and the Clinton School of Public Service. The Library facility, designed by architect James Polshek, cantilevers over the Arkansas River, echoing Clinton's campaign promise of "building a bridge to the 21st century". The archives and library contains 2 million photographs, 80 million pages of documents, 21 million e-mail messages, and nearly 80,000 artifacts from the Clinton presidency. The museum within the library showcases artifacts from Clinton's term and has a full-scale replica of the Clinton-era Oval Office. Opened on November 18, 2004, the Clinton Presidential Center cost $165 million to construct and covers 150,000 square feet (14,000 m²) within a 28-acre (113,000 m²) park. The Historic Arkansas Museum is a regional history museum focusing primarily on the frontier time period. The MacArthur Museum of Arkansas Military History opened in 2001, the last remaining structure of the original Little Rock Arsenal and one of the oldest buildings in central Arkansas, it was the birthplace of General Douglas MacArthur who went on to be the supreme commander of US forces in the South Pacific during World War II. The Old State House Museum is a former state capitol building now home to a history museum focusing on Arkansas' recent history. The Mosaic Templars Cultural Center is a state operated history museum focusing on African American history and culture in Arkansas. Founded in 1976, the Arkansas Repertory Theatre is the state's largest nonprofit professional theatre company. A member of the League of Resident Theatres (LORT D), The Rep has produced more than 300 productions, such as 40 world premieres, in its building located in downtown Little Rock. Producing Artistic Director John Miller-Stephany leads a resident staff of designers, technicians and administrators in eight to ten productions for an annual audience in excess of 70,000 for MainStage productions, educational programming and touring. The Rep produces works from contemporary comedies and dramas to world premiers and the classics of dramatic literature. Outside magazine named Little Rock one of its 2013 Best Towns. Dozens of parks such as Pinnacle Mountain State Park are in Little Rock. The city has operated under the city manager form of government since November 1957. In 1993, voters approved changes from seven at-large city directors (who rated the position of mayor among themselves) to a popularly elected mayor, seven ward directors and three at-large directors. The position of mayor remained a part-time position until August 2007. At that point, voters approved making the mayor's position a full-time position with veto power. The current Mayor is Frank Scott Jr., a former bank executive, pastor and state highway commissioner. The current City Manager is Bruce T. Moore, who is the longest-serving City Manager in Little Rock history. The city employs over 2,500 individuals in 14 different departments, including the Police Department, the Fire Department, Parks and Recreation, and the Zoo. Little Rock is home to two universities that are part of the University of Arkansas System: the campuses of the University of Arkansas at Little Rock and the University of Arkansas for Medical Sciences are located in the city. A pair of smaller, historically black colleges, Philander Smith College, affiliated with the United Methodist Church, and Arkansas Baptist College, are also located in Little Rock. The University of Arkansas at Little Rock was founded in 1927 as Little Rock Junior College, under the supervision of the city Board of Education. In its first semester, there were eight instructors and about 100 students. The college is accredited by the North Central Association of Colleges and Schools, a status it has kept since 1929. Housed originally in public school buildings, the college moved in 1949 to another location between University Ave and Fair Park Blvd, North of Asher Ave., on land donated by Raymond Rebsamen, a Little Rock businessman. The college was the sole beneficiary of a continuing trust established by former Governor George W. Donaghey at the time. In 1957, the institution began a four-year degree program, became independent and privately supported under a separate board of trustees, and took the name Little Rock University. In September 1969, The Little Rock University merged into the University of Arkansas System, to create the University of Arkansas at Little Rock. The University of Arkansas System merger began a period of steady growth, which saw UALR go from about 3,500 students and 75 full-time faculty members in 1969 to about 10,000 students and over 400 full-time faculty members in the 1998 academic year. The university consists of 54 undergraduate major programs, an extensive schedule of night, weekend, and off-campus classes, and various community educational services. UALR began offering graduate and professional work in 1975. Besides the juris doctor offered at the William H. Bowen School of Law, UALR has three doctoral programs and 29 graduate and professional programs, and joint programs with other campuses of the University of Arkansas System. The University of Arkansas for Medical Sciences (UAMS) is part of the University of Arkansas System. UAMS has about 2,200 students in six academic units: the Colleges of Medicine, Pharmacy, Nursing, Health Related Professions, and Public Health and the Graduate School. UAMS also has more than 660 resident physicians completing their training at UAMS or at one of the seven Area Health Education Centers around the state. UAMS provides hospital and outpatient care, and houses the Winthrop P. Rockefeller Cancer Institute, Harvey and Bernice Jones Eye Institute, Donald W. Reynolds Institute on Aging, Myeloma Institute for Research and Therapy, and Jackson T. Stephens Spine and Neurosciences Institute. Arkansas Children's Hospital and the Central Arkansas Veterans Healthcare System are affiliates of UAMS. The outreach efforts of UAMS has seven Area Health Education Centers (AHECs) in Fayetteville, Pine Bluff, El Dorado, Texarkana, Fort Smith, Jonesboro, and Helena, Arkansas; networks of senior health centers and centers for young children with special health care needs; and interactive video education and medical consultation services to community hospitals around the state. UAMS is the state's largest basic and applied research institution with programs in multiple myeloma, aging, and other areas. Located in downtown is the Clinton School of Public Service, a branch of the University of Arkansas System, which offers master's degrees in public service. Pulaski Technical College has two locations in Little Rock. The Pulaski Technical College Little Rock-South site houses programs in automotive technology, collision repair technology, commercial driver training, diesel technology, small engine repair technology and motorcycle/all-terrain vehicle repair technology. The Pulaski Technical College Culinary Arts and Hospitality Management Institute and The Finish Line Cafe are also located in Little Rock-South. There is a Missionary Baptist Seminary in Little Rock associated with the American Baptist Association. The school began as Missionary Baptist College in Sheridan in Grant County. President Bill Clinton led celebrations of the 40th anniversary of desegregation at Little Rock Central High School. Little Rock is home to both the Arkansas School for the Blind (ASB) and the Arkansas School for the Deaf (ASD), which are state-run schools operated by the Board of Trustees of the ASB–ASD. In addition, eStem Public Charter High School and LISA Academy provide tuition-free public education as charter schools. The city's comprehensive public school system is operated by the Little Rock School District (LRSD). As of 2012[update], the district consists of 64 schools with more schools being built. As of the 2009–2010 school year, the district has enrollment of 25,685. It has 5 high schools, 8 middle schools, 31 elementary schools, 1 early childhood (pre-kindergarten) center, 2 alternative schools, 1 adult education center, 1 accelerated learning center, 1 career-technical center, and about 3,800 employees. Little Rock previously had a Catholic high school for African-Americans, St. Bartholomew High School; it closed in 1964. The Catholic grade school St. Bartholomew School, also established for African-Americans, closed in 1974. The Our Lady of Good Counsel School closed in 2006. The Central Arkansas Library System comprises the main building downtown and numerous branches throughout the city, Jacksonville, Maumelle, Perryville, Sherwood and Wrightsville. The Pulaski County Law Library is at the William H. Bowen School of Law. American Taekwondo Association World Headquarters. The American Taekwondo Association [ATA] is based in Little Rock where it hosts the World Taekwondo Championships each summer. The ATA World Headquarters is also headquarters for all of the Songahm Taekwondo organizations such as the American Taekwondo Association, the Songahm Taekwondo Federation and the World Traditional Taekwondo Union. These combined organizations have millions of members in the US and worldwide. Arkansas State Capitol – a neo-classical structure with many restored interior spaces, constructed from 1899 to 1915. Big Dam Bridge – The longest pedestrian/bicycle bridge in North America that has never been used by cars or trucks. Little Rock Zoo – Consists of at least 725 animals and over 200 species. Willow Springs Water Park – one of the first water theme parks in the U.S. built in 1928. A poster traced back to the Cicada 3301 mystery was discovered in downtown Little Rock. Little Rock is home to the Arkansas Travelers. They are the AA professional Minor League Baseball affiliate of the Seattle Mariners in the Texas League. 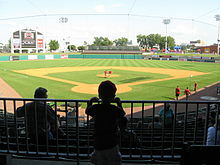 The Travelers played their last game in Little Rock at Ray Winder Field on September 3, 2006, and moved into Dickey-Stephens Park in nearby North Little Rock in April 2007. The Little Rock Rangers soccer club of the National Premier Soccer League played their inaugural seasons in 2016 & 2017 for the men's and women's teams respectively. Home games are played at War Memorial Stadium. Little Rock was also home to the Arkansas Twisters (later Arkansas Diamonds) of Arena Football 2 and Indoor Football League and the Arkansas RimRockers of the American Basketball Association and NBA Development League. Both of these teams played at Verizon Arena in North Little Rock. The city is also home to the Little Rock Trojans, the athletic program of the University of Arkansas at Little Rock. The majority of the school's athletic teams are housed in the Jack Stephens Center, which opened in 2005. The Trojans play in the Sun Belt Conference, where the Arkansas State Red Wolves are their chief rival. Little Rock's War Memorial Stadium plays host to at least one University of Arkansas Razorback football game each year. The stadium is known for being in the middle of a golf course. Each fall, the city closes the golf course on Razorback football weekends for fans to tailgate. It is estimated that over 80,000 people are present for the tailgating activities on these weekends. War Memorial also hosts the Arkansas High School football state championships, and starting in the fall of 2006 hosts one game apiece for the University of Central Arkansas and the University of Arkansas at Pine Bluff. Arkansas State University also plays at the stadium from time to time. Little Rock is home to the Grande Maumelle Sailing Club. Established in 1959, the club hosts multiple regattas during the year on both Lake Maumelle and the Arkansas River. Little Rock is also home to the Little Rock Marathon, held on the first Saturday of March every year since 2003. The marathon features the world's largest medal given to marathon participants. The Arkansas Democrat Gazette is the largest newspaper in the city, as well as the state. As of March 31, 2006, Sunday circulation is 275,991 copies, while daily (Monday-Saturday) circulation is 180,662, according to the Audit Bureau of Circulations. The monthly magazine Arkansas Life is part of the newspaper's niche publications division, and began publication in September 2008. From 2007 to 2015, the newspaper also published the free tabloid Sync Weekly. Many television networks have local affiliates in Little Rock, in addition to numerous independent stations. As for cable TV services, Comcast has a monopoly over Little Rock and much of Pulaski County. Some suburbs have the option of having Comcast, Charter or other cable companies. Little Rock is served by two primary Interstate Highways and four auxiliary Interstates. 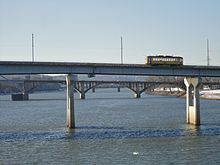 I-40 passes through North Little Rock to the north, and I-30 enters the city from the south, terminating at I-40 in the north of the Arkansas River. Shorter routes designed to accommodate the flow of urban traffic across town include I-430, which bypasses the city to the west, I-440, which serves the eastern part of Little Rock including Clinton National Airport, and I-630 which runs east–west through the city, connecting west Little Rock with the central business district. I-530 runs southeast to Pine Bluff as a spur route. US 70 parallels I-40 into North Little Rock before multiplexing with I-30 at the Broadway exit (Exit 141B). US 67 and US 167 share the same route from the northeast before splitting. US 67 and US 70 multiplex with Interstate 30 to the southwest. US 167 multiplexes with US 65 and I-530 to the southeast. Seven airlines serve 14 national/international gateway cities, e.g. Atlanta, Dallas, Chicago, Charlotte, Orlando etc. from Clinton National Airport. In 2006 they carried approximately 2.1 million passengers on approximately 116 daily flights to and from Little Rock. In July 2017, a seventh airline, Frontier Airlines, announced that they would be resuming scheduled operations to Denver in 2018. Greyhound Lines serves Dallas and Memphis, as well as intermediate points, with numerous connections to other cities and towns. Jefferson Lines serves Fort Smith, Kansas City, and Oklahoma City, as well as intermediate points, with numerous connections to other cities and towns. These carriers operate out of the North Little Rock bus station. Within the city, public bus service is provided by the Rock Region Metro, which until 2015 was named the Central Arkansas Transit Authority (CATA). As of January 2010, CATA operated 23 regular fixed routes, 3 express routes, as well as special events shuttle buses and paratransit service for disabled persons. Of the 23 fixed-route services, 16 offer daily service, 6 offer weekday service with limited service on Saturday, and one route runs exclusively on weekdays. The three express routes run on weekday mornings and afternoons. Since November 2004, downtown areas of Little Rock and North Little Rock have been additionally served by the Metro Streetcar system (formerly the River Rail Electric Streetcar), also operated by Rock Region Metro. The Streetcar is a 3.4-mile (5.5 km)-long heritage streetcar system that runs from the North Little Rock City Hall and throughout downtown Little Rock before crossing over to the William J. Clinton Presidential Library. The streetcar line has fourteen stops and a fleet of five cars with a daily ridership of around 350. According to the 2016 American Community Survey, 82.9 percent of working Little Rock residents commuted by driving alone, 8.9 percent carpooled, 1.1 percent used public transportation, and 1.8 percent walked. About 1.3 percent commuted by all other means of transportation, including taxi, bicycle, and motorcycle. About 4 percent worked out of the home. In 2015, 8.2 percent of city of Little Rock households were without a car, which increased slightly to 8.9 percent in 2016. The national average was 8.7 percent in 2016. Little Rock averaged 1.58 cars per household in 2016, compared to a national average of 1.8 per household. 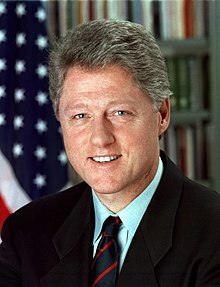 Bill Clinton (born 1946), former President of the United States and former governor of the state, lived in the city. Chelsea Clinton (born 1980), daughter of Bill and Hillary Clinton, was born in Little Rock. John Gould Fletcher (1886–1950), Pulitzer Prize-winning Imagist poet and author, was born in Little Rock. The Fletcher Branch Library of the Central Arkansas Library System is named after him. Bill Hicks (1961–1994), American comedian and social critic, died at his parents' home in Little Rock. Amy Lee (born 1981) lead vocalist of rock/metal band Evanescence born in Little Rock. 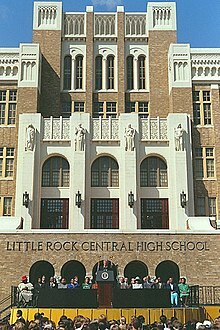 The Little Rock Nine, group of nine African American students who were enrolled in 1957 in Little Rock Central High School and were initially prevented by the state government from entering the racially segregated school. The group was ultimately allowed to attend after the federal government intervened. Among other accomplishments and accolades, they all received the Spingarn Medal from the NAACP in 1958 and the Congressional Gold Medal from President Bill Clinton in 1999. Douglas MacArthur (1880–1964), U.S. general, was born in Little Rock. James Smith McDonnell —Aviation pioneer and founder of McDonnell Aircraft Corporation. Sanford N. McDonnell —Engineer, businessman and philanthropist; former Chairman and CEO of McDonnell Douglas. Charlotte Moorman (1933–1991), cellist and advocate for avant-garde music born in Little Rock. Brooks Robinson (born 1937), Hall of Fame 3rd baseman for the Baltimore Orioles. Born in Little Rock and graduated from Little Rock High School in 1955. Winthrop Rockefeller (1912–1973), businessman, philanthropist, and the first Republican governor of Arkansas since Reconstruction and the grandson of John D. Rockefeller, lived in the city and in Conway County. Pharoah Sanders (born October 13, 1940) is an American jazz saxophonist. Born in Little Rock. Sheryl Underwood (born 1963), Emmy-winning co-host of The Talk, stand-up comedian, and actress, was born in Little Rock. ^ "2017 U.S. Gazetteer Files". United States Census Bureau. Retrieved August 22, 2018. ^ "American FactFinder". United States Census Bureau. Retrieved June 2, 2018. ^ "American FactFinder". United States Census Bureau. Retrieved June 21, 2014. ^ "Census shows overall state population up 9.1 percent". Arkansasonline.com. February 10, 2011. Retrieved May 22, 2012. ^ "Our Historical City". City of Little Rock. Retrieved September 3, 2016. ^ "The Hyde Park Historical Record". Hyde Park Historical Society. December 29, 2017 – via Google Books. ^ Williams, C. Fred (December 29, 2017). "Historic Little Rock: An Illustrated History". HPN Books – via Google Books. ^ Herndon, Dallas Tabor (December 29, 2017). "The High Lights of Arkansas History". Arkansas History commission – via Google Books. ^ Bradbury, Cary (November 14, 2007). "North Little Rock (Pulaski County)". Retrieved May 15, 2008. ^ Clinton, Bill (2004). My Life. Knopf Publishing Group. p. 244. ^ "Climate Statistics for the Little Rock Area" (PDF). National Weather Service North Little Rock. Archived from the original (PDF) on November 1, 2011. Retrieved December 7, 2011. ^ "NowData – NOAA Online Weather Data". National Oceanic and Atmospheric Administration. Retrieved October 18, 2018. ^ "Station Name: AR LITTLE ROCK AP ADAMS FLD". National Oceanic & Atmospheric Administration. Retrieved March 28, 2014. ^ "Monthly Averages for Little Rock, AR (72201)". The Weather Channel. Retrieved February 17, 2012. 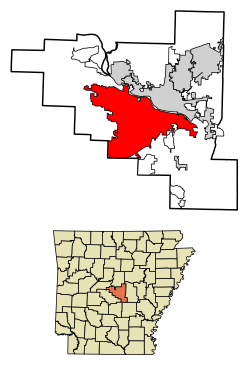 ^ "Arkansas – Race and Hispanic Origin for Selected Cities and Other Places: Earliest Census to 1990". U.S. Census Bureau. Archived from the original on August 6, 2012. Retrieved April 21, 2012. ^ a b Prodis, Julia (October 1, 1995). "Little Rock's Boyz in the Hood Illustrate '90s American Graffiti : Violence: Gangs have colonized even small cities, bringing big-city crime with them. Lifestyle wins adherents via television". Los Angeles Times. Retrieved March 21, 2017. ^ Eckholm, Erik (January 31, 1993). "Teen-Age Gangs Are Inflicting Lethal Violence on Small Cities". The New York Times. Retrieved March 21, 2017. ^ Koon, David; Herron, Kaya (July 15, 2015). "Bangin' in the '90s: An oral history: Police, former gang members, city leaders look back at Little Rock's gang wars". Arkansas Times. Retrieved March 21, 2017. ^ "Little Rock Branch | Regional Executive Robert Hopkins". St. Louis Fed. Retrieved February 25, 2014. ^ "arkansassymphony.org". arkansassymphony.org. Retrieved February 25, 2014. ^ Hargett, Malea (May 12, 2012). "State's last black Catholic school to close". Arkansas Catholic. Retrieved July 31, 2017. ^ Hargett, Malea (March 28, 2013). "Despite 'year of grace,' St. Joseph School will close". Arkansas Catholic. Retrieved July 31, 2017. ^ Tugman, Lindsey (March 11, 2014). "10 more unsolved Arkansas mysteries". KTHV. Archived from the original on March 13, 2014. Retrieved March 13, 2014. ^ "Sync weekly magazine to cease publication Wednesday". Arkansas Online. October 23, 2015. Retrieved June 22, 2018. ^ General Highway Map, Pulaski County, Arkansas (PDF) (Map). 1:62500. Cartography by Planning and Research Department. Arkansas State Highway and Transportation Department. December 22, 2011. Archived (PDF) from the original on July 7, 2011. Retrieved March 9, 2013. ^ "Car Ownership in U.S. Cities Data and Map". Governing. Retrieved May 6, 2018. ^ "John Gould Fletcher". The Central Arkansas Library System. Retrieved September 8, 2013. ^ a b c d "Boards and Commissions City of Little Rock". littlerock.org. Retrieved July 21, 2015. ^ Cite error: The named reference https://www.caxias.rs.gov.br/comunicacao/noticias_ler.php?codigo=44382 was invoked but never defined (see the help page). Morgan, James. "Little Rock: The 2005 American Heritage Great American Place" American Heritage, October 2005. Redefining the Color Line: Black Activism in Little Rock, Arkansas, 1940-1970, John A. Kirk, 2002. This page was last edited on 18 April 2019, at 17:37 (UTC).